This article is a short summary of Mario Tennis Open. Compete with friends, family and rivals on the court in singles or doubles matches! 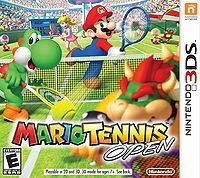 Mario Tennis Open plays all the fundamentals of the sport tennis. Various characters from the Super Mario series can play tennis, utilizing a variety of different shots, such as topspin shots, slices, flat shots, lobs and drop shots. If the character is standing within a coloured circle representing a certain kind of shot, and the character uses said shot on the tennis ball, they will use a more powerful or effective version of that shot.